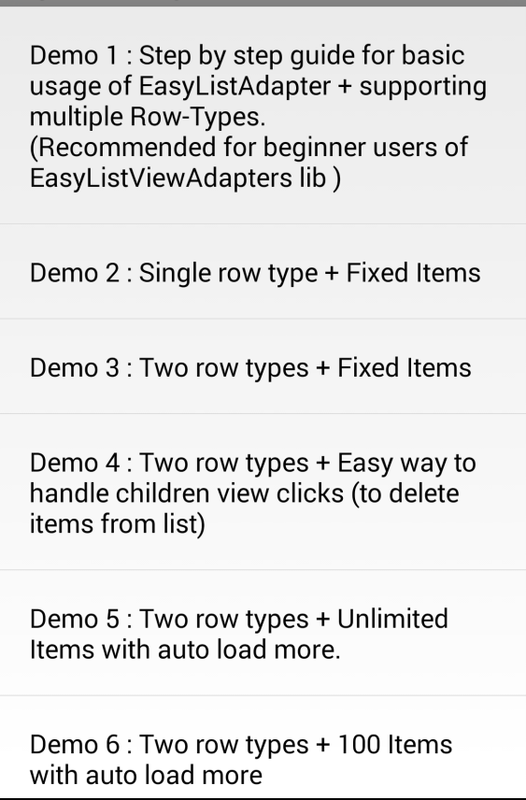 Whenever you want to display custom items in listview, then only way to achieve this is to implement your own subclass of BaseAdapter, handle all rendering, recycling, click handling ,data browsing youself in getView() method. It becomes very messy as number of rows increase in your adapter, Making your code very messy & non-reusable. 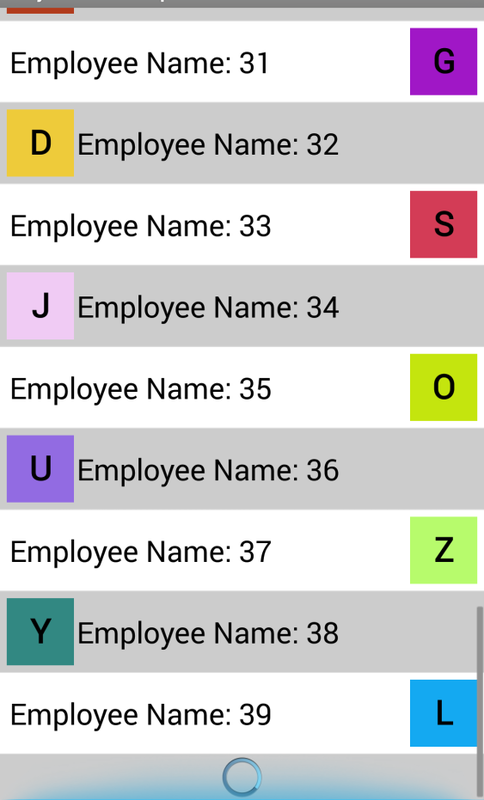 This library allows you to make Modular classes which will help you to introduce new row type easily. This library is designed on [ViewHolder] (http://developer.android.com/training/improving-layouts/smooth-scrolling.html#ViewHolder) design pattern, it provides an easier way of linking multiple type rows and their underlying data. The EasyAdapters will do most of tedious work for you & all you have to do is create your small modular classes & link them together. Looking for GridView like card support within your ListView (with added capabilities), check GridListViewAdapters. Easier than implementing your own Adapter (ie handling BaseAdaper#getView).Very Easier to provide multi-row support. Cleaner code. By keeping different RowViewSetter classes for different row-types makes your code easy to manage & easy to reuse. No data browsing, Library takes care of browsing data through data-structure when View is being drawn or event occurs so that Users does not have to look for their data to take actions. 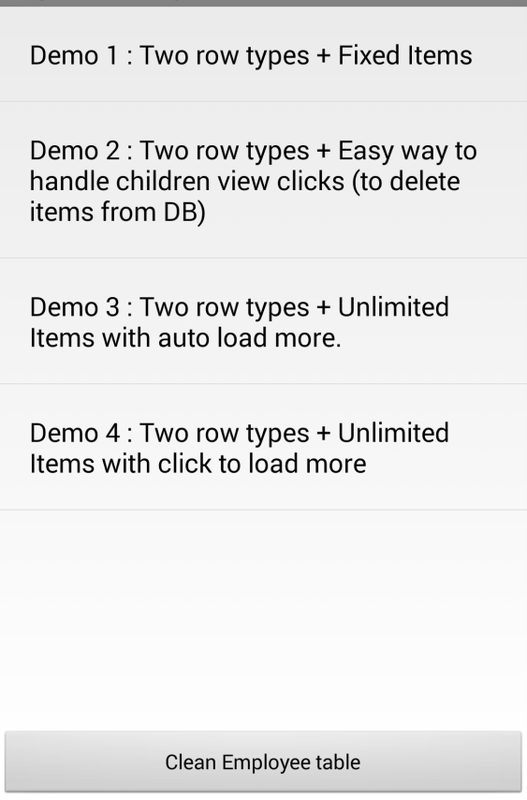 Just by passing correct row-types library will Auto-map your data-types to row-types to render views. Row views can be created by using XML or Java (doesn't restrict to XML-Only Approach). Handling children viewclicks, you can also register for Children(present inside your rows) view click events. All these Views are registered with single OnClickListner so that this mechanism is very memory efficient when click event occurs users you gets clickedChildView, rowData,int eventId as callback params. 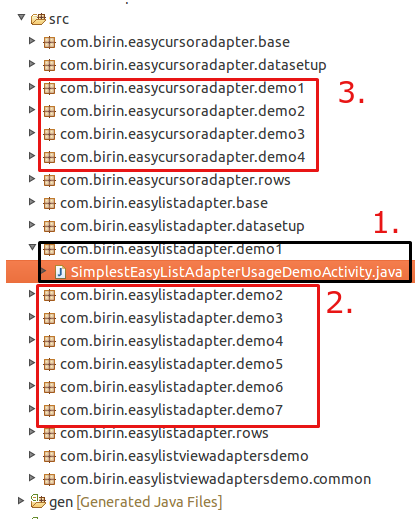 EasyListAdapter : works with java.util.List of data. Note : EasyCursorAdapter doesn't provide any mechanism to requery attached Cursor (Like traditional CursorAdapter), This behaviour is intentionally omitted as it has been deprecated from Android Sources as well.Instead use CursorLoader Mechanism. 2 Read other EasyListAdapter's Demo. 3 Read other EasyCursorAdapter's Demo.